While this is great for writing clean expressive code I wondered how and what point the members actually get initialized. 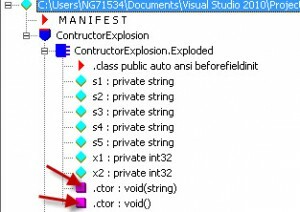 For example if I declare a class with a member initialization as above with three different constructors that can be independently used by a consumer of my class to instantiate an object of the class, how does the .NET runtime ensure that this variable declared above is initialized and ready for consumption when an object of my class is instantiated? So I loaded up IL DASM and I noticed what looked like a “code explosion” in the MSI! It turns out the CSC compiler takes a very interesting “code duplication” approach to initialize type level members. Think back to the modules you have designed in the past that initialized type members using the convenient syntax. That initialization logic was in-lined by the CSC compiler within each constructor that your type defined. Here I have setup one base constructor which does the field initialization and then all other constructors roll up to this one constructor. Calls the second overloaded constructor which then calls the first constructor. If you examine the MSIL as generated by this code below, you would notice that all the duplicated initialization statements are now gone! So what about types with no explicit constructor? If you examine the MSIL generated for this class, you would observe that a default constructor was added to this class and further the initialization logic was in-lined in this constructor as per the explanation given above.